Sliver craftworks (銀細工) is one of the traditional Japanese metal art form which used many aspects of all Japanese items from Samurai armers and helmets to Geisha accesories. Mr. Isao Kojima (小島功) is now succeeded his father name Nobushige who is the former owner of his sliver craft work. 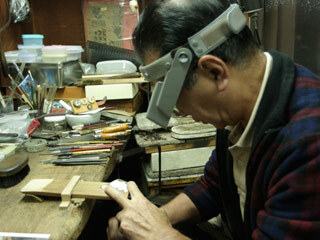 All his process are traditional Japanese metal work which represent all made by hands work. Mr. Kojima's policy is mading great arts by hands which make his work only one exist in the world. The tradition and his sprits with his ancestors are in his work. "Kanzashi" "Pendant" "Small Scale Bonus Present"
Silver Craftwork (鎚起工芸) is one of the traditional Japanese metal art form which used many aspects of all Japanese items from Samurai armers and helmets to Geisha accesories. As one of the precious metal work, Silver Craftwok has developed in long time ago. All of Samurai and Geizsha metal works are used this traditional process. Mr. Isao Kojima as Nobushige the second is silver craftman who has succeeded Suetsugu style metal craftwork. Suetsugu style is traditional metal craftwork from Edo period. The former Nobushige has succeeded those excellent and mastered technique form his family and Mr. Kojima is also succeeded. Now, he is the owner of Ginkobo Kojima (銀工房こじま). The entire family served this silver craftworks. Some of their work has been given up to the emperor. Moreover, their traditional craftworks produce many traditional items such as "Kanzashi" which is hair ornaments used in traditional Japanese hairstyle, "Mikoshi" samples, decoration of Samurai helmets, and many miniatures. Currently, his style of work is stay in the traditional way of making, but apply to the modern design form with other beautiful craftwork such as glass arts. Kanzashi shown in the picture is the collaboration work with Ms. Hayashi (林祐子). All his work is made by hands which makes all his work exist only one in the world. Precious metal ship is the one of the great master piece with all his mastered technique. - Rozuke (鑞付け) : welding on candle to make silver in certain shape to begin with. Private custom decoration and items are available. Please feel free to bring your plane for your gift.